How many of you are mango lovers like me????? So, before we bid adieu to our king of fruits Mango, let's make this No Churn Mango Ice-cream using only 3 ingredients. Yes you heard it right!!!! Are you ready to see what is this recipe all about???? You will be amazed to see how quick this ice-cream can be prepared with out too much of prep work or churning. This has been on my list for a long time but has been put off for some reason or the other. There are so many things we can make using mango like desserts, pickles and even savory dishes. But this is one of the easiest recipes that I have ever made. You can enjoy this all year long using the canned mango pulp if you don't have the fresh ones. I didn't have the fresh ones too, so I used the canned one. Here is how you can make Mango Pulp at home without any preservatives Now lets look at the recipe. Pour all the ingredients in a mixing bowl. Using an electric mixer or a hand mixer, mix everything well. Then transfer the mixture into a freezer safe container. Cover with a serene wrap and then the lid. Freeze it for 2 hours then add the cubed mango pieces and give it a mix. Now freeze it overnight and enjoy this homemade ice-cream whenever you are in a mood for a scoop. 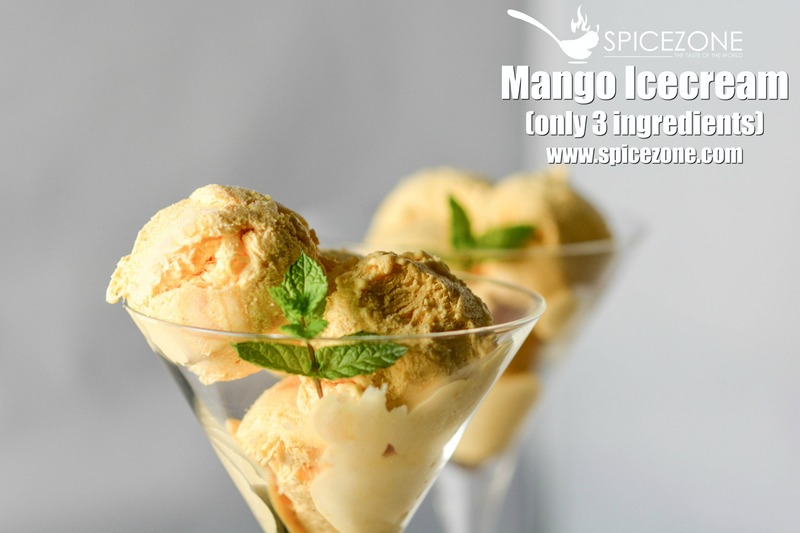 An amazing recipe of no churn Mango Ice-cream using only 3 ingredients which will impress you and your guests for your next get together. 2 Responses to "Mango Ice-cream (Only 3 ingredients)"
this recipe looks great! Mango is my favourite! Ice cream looks amazing… super easy super delicious..